Shackled by impotent pride and stalled ambitions, your humble narrator can often be observed scuttling along area sidewalks, a strange old man identified by malign aspect and the odd omnipresence of a camera. A great dread is experienced when someone on the street perceives my phantasmic presence, and I am forced into an encounter with someone who is unashamedly alive. 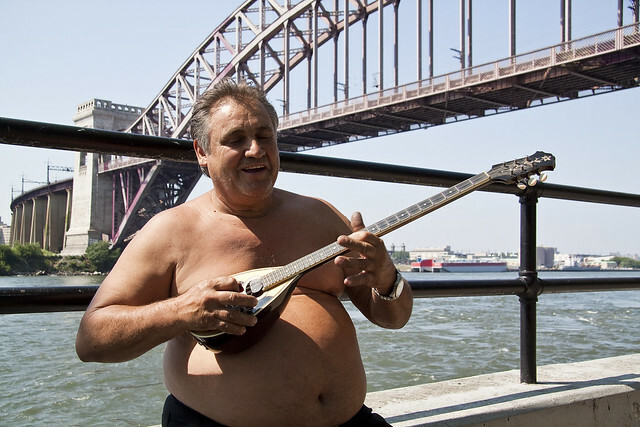 Just such an encounter was had near Hells Gate on the East River, near Astoria Park, at the end of June 2010. Although widely known for its beautiful pool, the oldest and largest in the city, Astoria Park offers more than aquatic pleasures. Outdoor tennis courts, a track, a bandstand, multiple trails, basketball courts, and playgrounds lure visitors from the five boroughs and beyond. And the views! 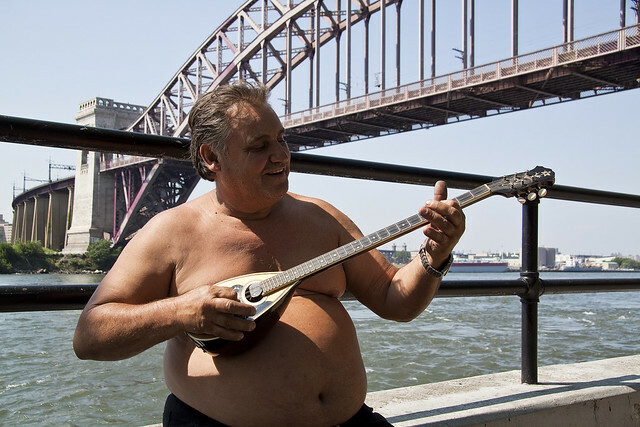 Sitting on the edge of the East River and resting between the Triborough Bridge and Hell Gate Bridge, the park offers shoreline sights and sounds that make the benches along its perimeter popular spots year-round. This gentleman informed me that he was an ethnic musician, and made his living playing hellenic folk music at area “tavernas” and at weddings. The instrument he carried was crafted by his ancestors, and he carried it with him to America when he arrived here in the early 1960’s. He did tell me his name, but I did not write it down. It might have been Peter. Perhaps George. Due to its proximity to Hell Gate, a turbulent area in the East River, this playground has been named for the monster Charybdis. According to Greek mythology, Charybdis was the daughter of Poseidon, the god of the sea. As a young nymph, she flooded lands to add to her father’s kingdom until Zeus, the supreme ruler of the gods, turned her into a monster. Charybdis and her partner Scylla are personifications of the violent waters in the Straits of Messina, which separate Sicily from the Italian peninsula. Charybdis was said to dwell under a fig tree on the Sicilian shore and, three times each day, drink from the strait and spit the water back into the strait several hours later, creating perilous whirlpools and terrifying sailors. In The Odyssey, by Homer, the hero survived Charybdis’s wrath by clinging to a tree for hours until she spit out the water and his raft floated to the surface. Practiced, his hands flew along the fret boards, and he demonstrated musical forms that are typical of the island cultures of the Hellenic Republic which is known as Greece to the english speaking world. His serenade was lilting, thrilling, and reminded me of the Greek musical genre called Rembetiko. The melodies of most rebetiko songs are thus often considered to follow one or more dromos or dromoi (gr. δρόμος, plural δρόμοι). The names of the dromoi are derived in all but a few cases from the names of various Turkish modes, known in Turkish as makam. However, the majority of rebetiko songs have been accompanied by instruments capable of playing chords according to the Western harmonic system, and have thereby been harmonized in a manner which corresponds neither with conventional European harmony, nor with Ottoman art music, which is a monophonic form normally not harmonized. Furthermore, rebetika has come to be played on instruments tuned in equal temperament, in direct conflict with the more complex pitch divisions of the makam system. He described the instrument he wielded as being well over a century old, and suggested that it had certain supernatural powers against which the female gender possesses no defense. He also claimed he could calm stormy seas with it, but one thing life in Astoria has taught me is that when a Greek guy is telling a good story well – just go with it. This is the classical type of bouzouki that was the mainstay of most Rebetiko music. It has fixed frets and it has 6 strings in three pairs. In the lower-pitched (bass) course, the pair consists of a thick wound string and a thin string tuned an octave apart. The conventional modern tuning of the trichordo bouzouki is Dd-aa-dd. This tuning was called the “European tuning” by Markos Vamvakaris, who described several other tunings, or douzenia, in his autobiography. 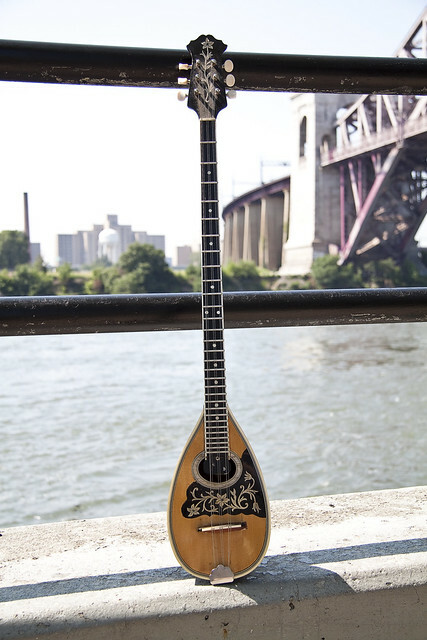 The illustrated bouzouki was made by Karolos Tsakirian of Athens, and is a replica of a trichordo bouzouki made by his grandfather for Markos Vamvakaris. The absence of the heavy mother of pearl ornamentation often seen on modern bouzoukia is typical of bouzoukia of the period. It has tuners for eight strings, but has only six strings, the neck being too narrow for eight. The luthiers of the time often used sets of four tuners on trichordo instruments, as these were more easily available, since they were used on mandolins. Charming guy, he was intent on hanging out at the park and mentioned something about the fishes wanting to hear some Rembetiko as I was taking my leave of him. Greek emigration to the United States started in earnest towards the end of the 19th century. From then onwards, and in the years following the Asia Minor Disaster, until immigration became restricted in the mid-1920s, a great number of Greeks emigrated to the United States, bringing their musical traditions with them. 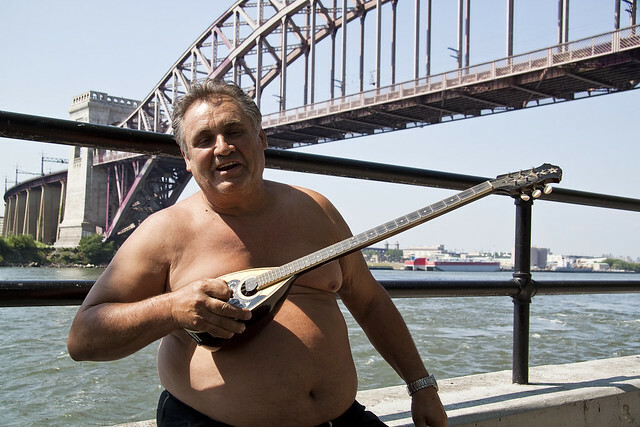 American companies began recording Greek music performed by these immigrants as early as 1896. The first Greek-American recording enterprises made their appearance in 1919. From the latter years of the second decade of the century there exist a number of recordings that can be considered as rebetiko, a few years before such songs began to appear on recordings in Greece. The music industry in the United States came to play a particular role from the mid-1930s onwards in recording rebetiko lyrics which would not have passed the censors in Greece. This phenomenon came to repeat itself during the period of the Greek military junta of 1967–1974. A notable example of American recording studios permitting some ‘bolder’ lyrics can be found in the LP “Otan Kapnizei O Loulas”, ie “When They Smoke The Hookah”, released in 1973. Releasing this album in Greece, with to its overt references to various aspects of drug use, would have been impossible at that time. It is worth noting, however, that the censorship laws invoked in Greece by Metaxas were never officially revoked until 1981, seven years after the fall of the junta. A further characteristic of American Greek recordings of the time was the continued recordings of songs in the Anatolian musical styles of rebetiko, which continued to be recorded in the United States well into the 1950s. Even songs originally recorded with typical bouzouki-baglamas-guitar accompaniment could appear in Anatolian garments. After WWII, beginning in the early 1950s, many Greek rebetiko musicians and singers traveled from Greece to tour the United States, and some stayed for longer periods. Prominent among them were Ioannis Papaioannou, Manolis Hiotis, Vassilis Tsitsanis, Iordanis Tsomidis, Roza Eskenazi, Stratos Pagioumdzis, Stavros Tzouanakos and Ioannis Tatasopoulos, of whom the latter three died in the United States. 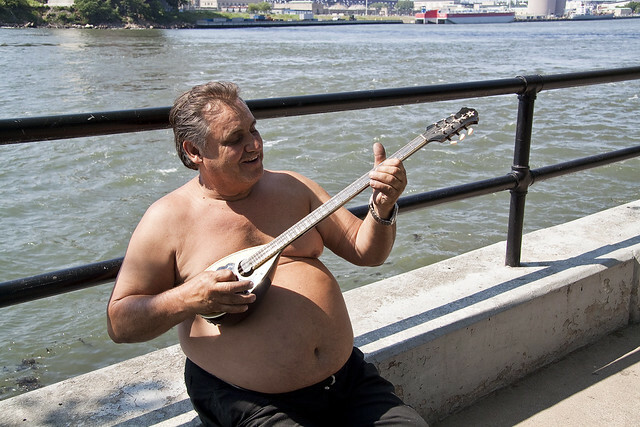 Clearly he was amused by the kayakers from the LIC Boat House as they passed by, and he launched into a wild melody on his centenarian instrument.